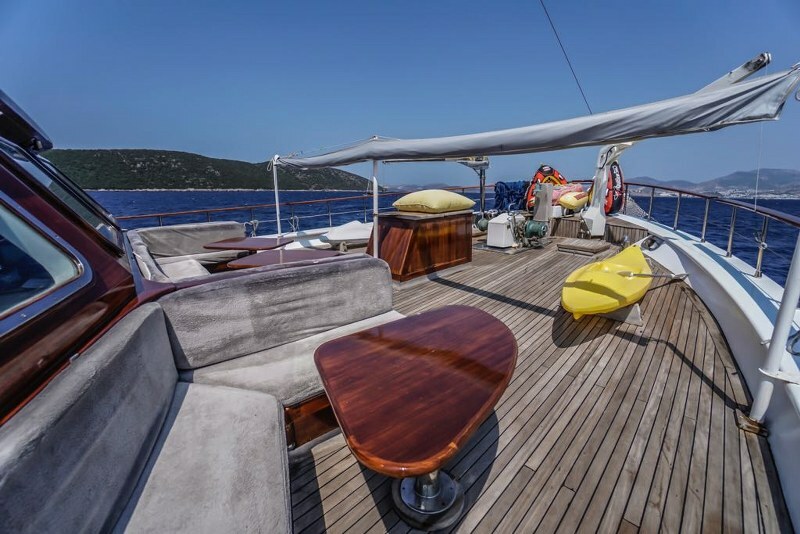 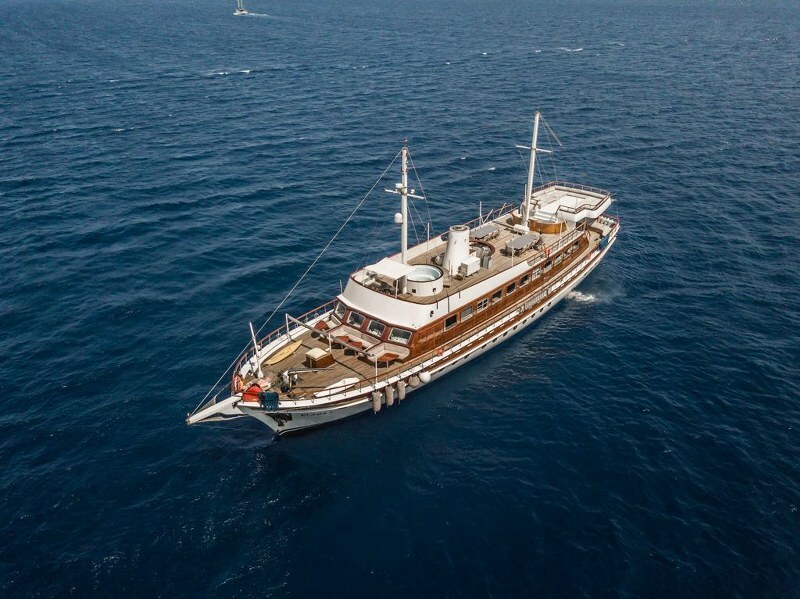 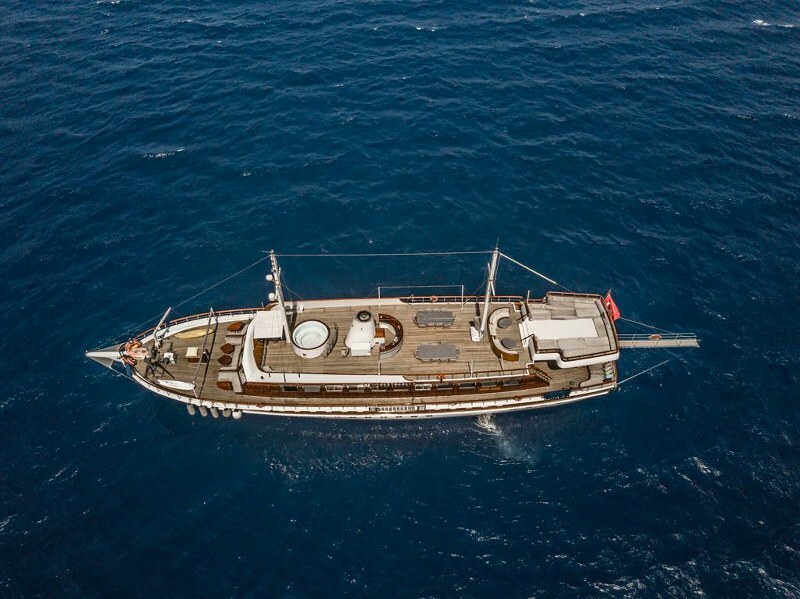 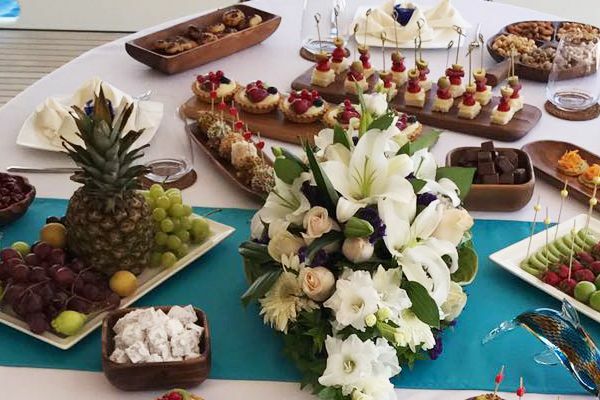 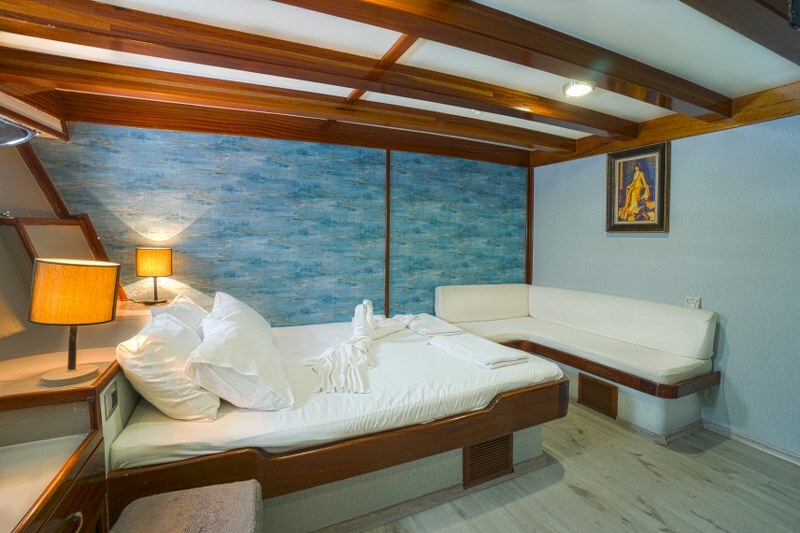 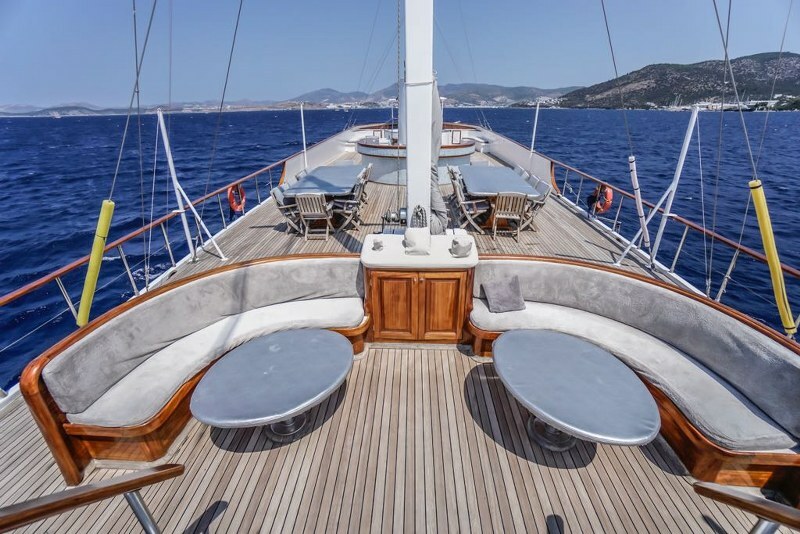 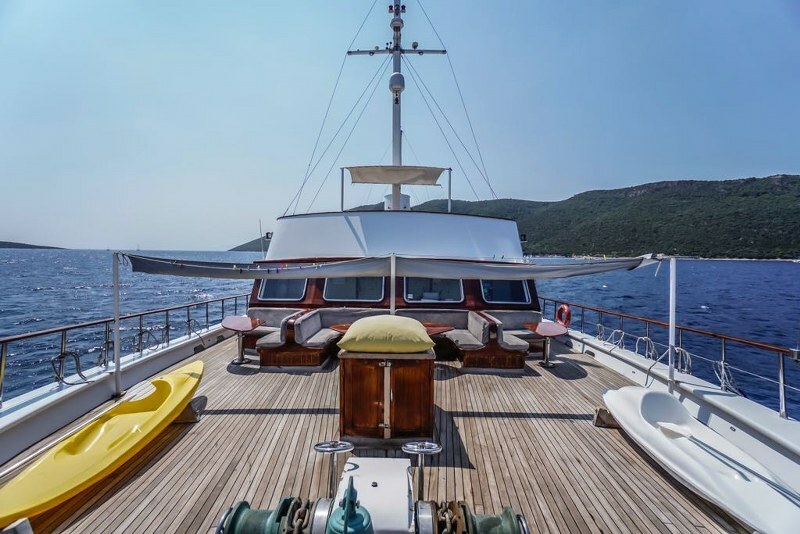 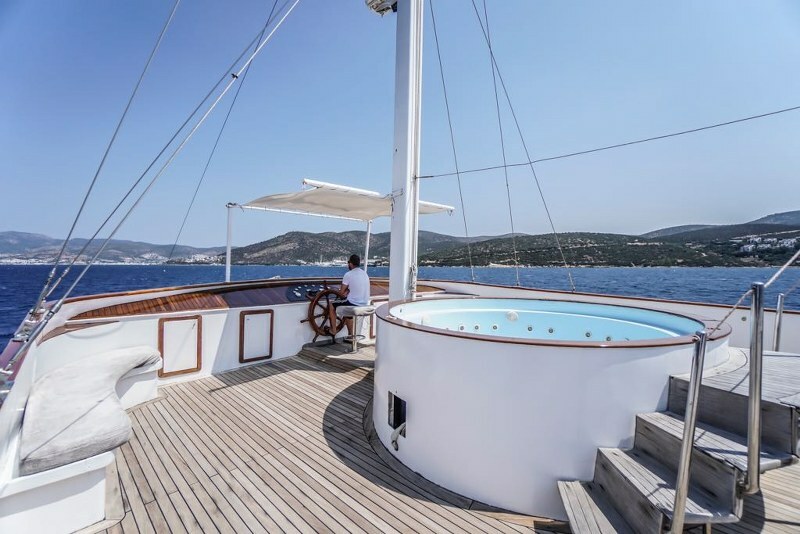 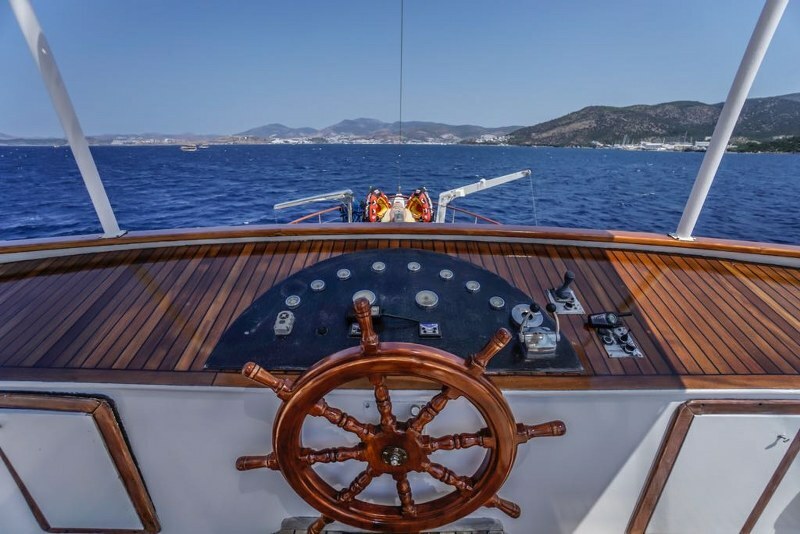 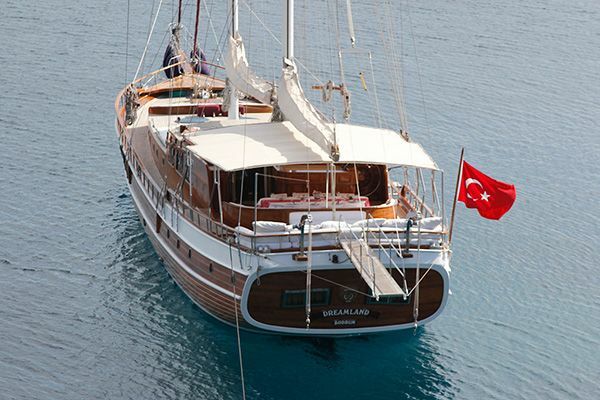 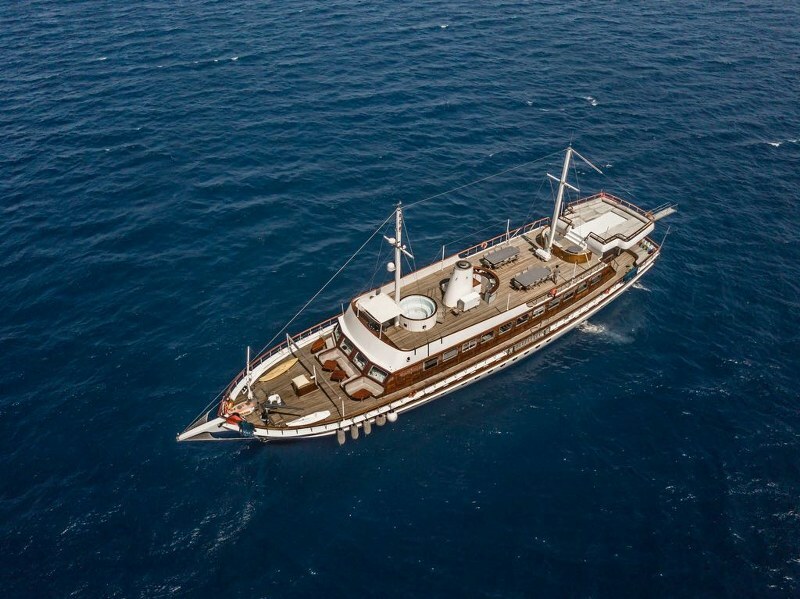 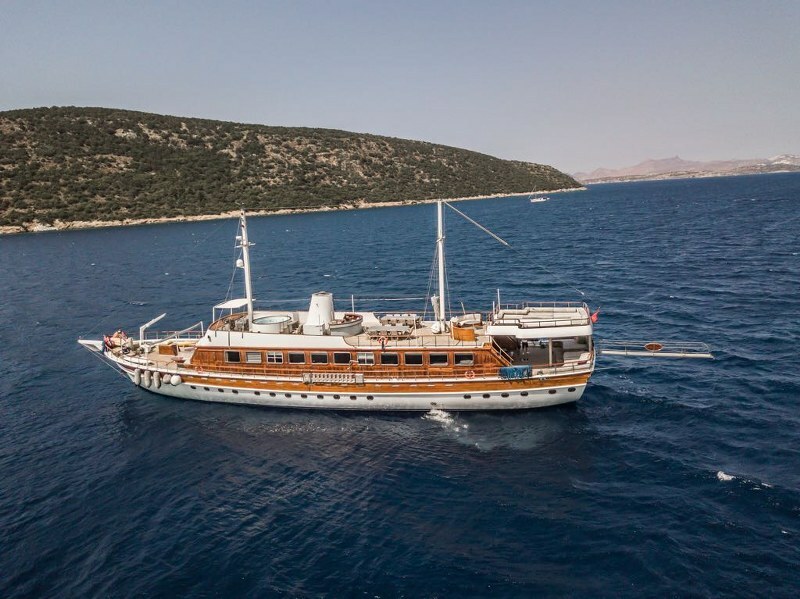 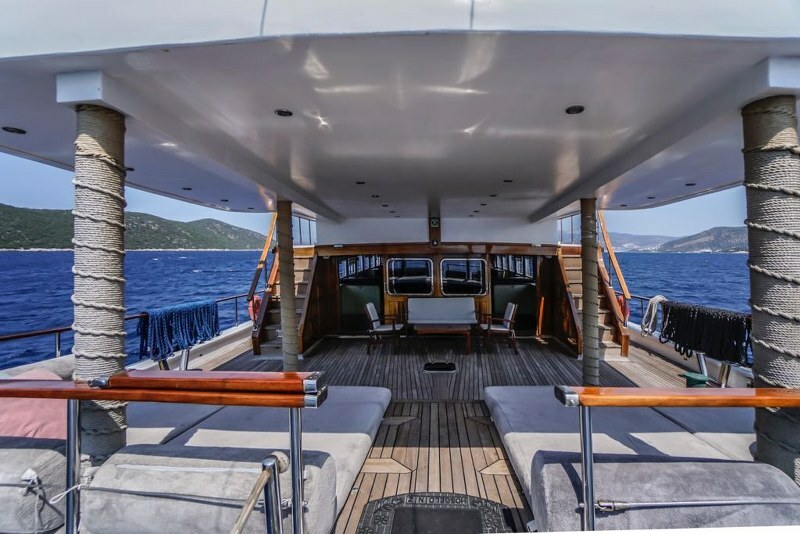 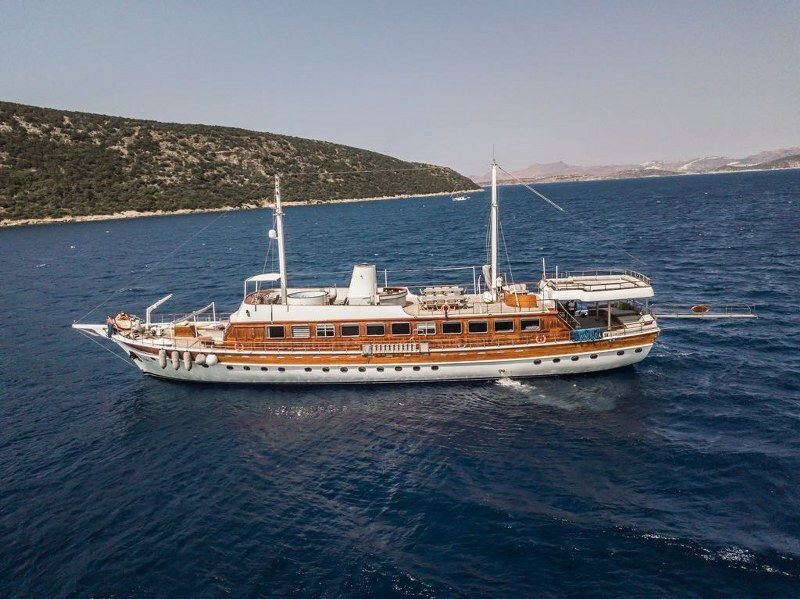 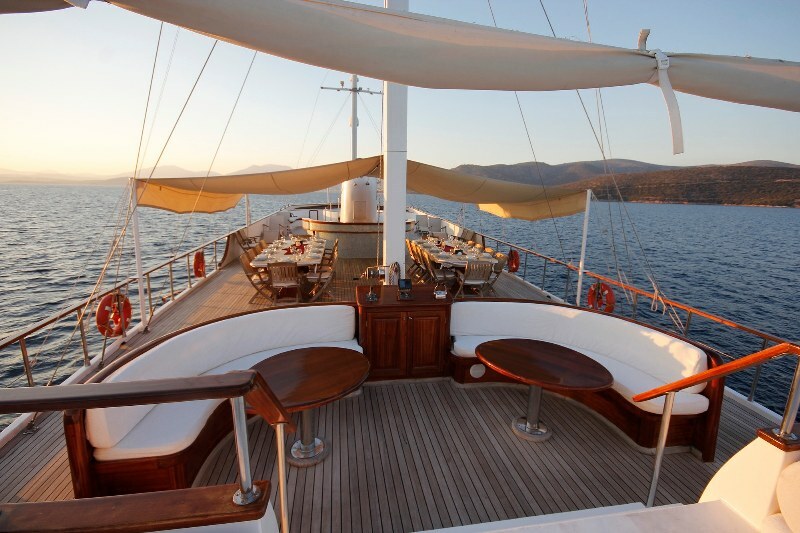 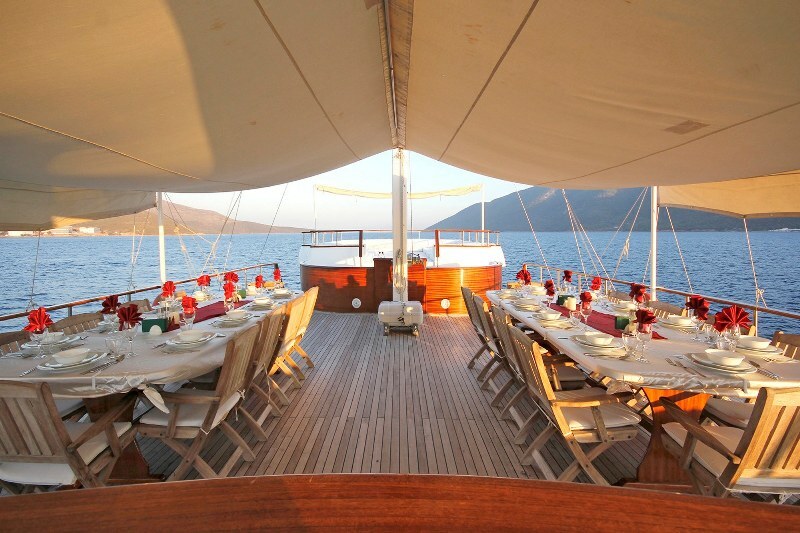 The twelve cabin yacht ELARA 1 ( formerly named Halis Temel gulet ) is one of the larger motorsailers to offer Deluxe gulet holidays along the Turkish coast and into the Greek Islands for large groups and families, or corporate meeting and incentive groups, of up to twenty-four guests. 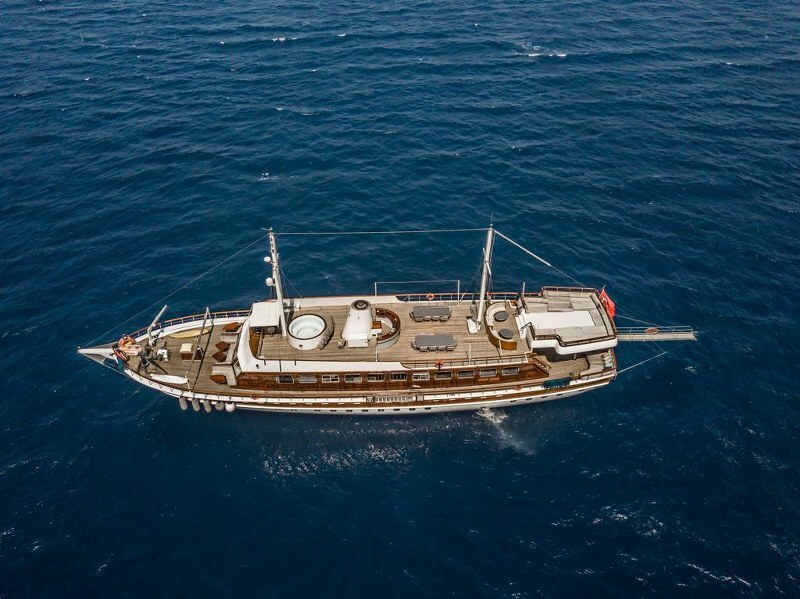 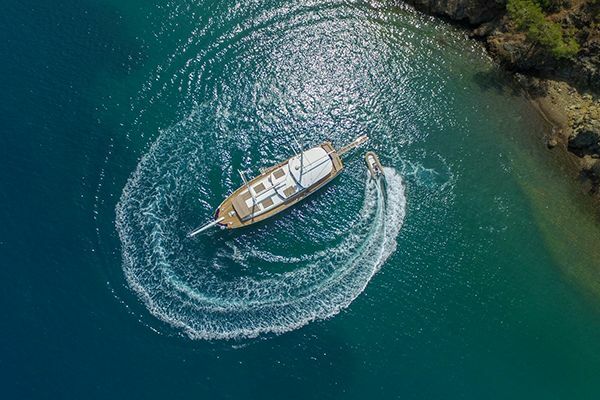 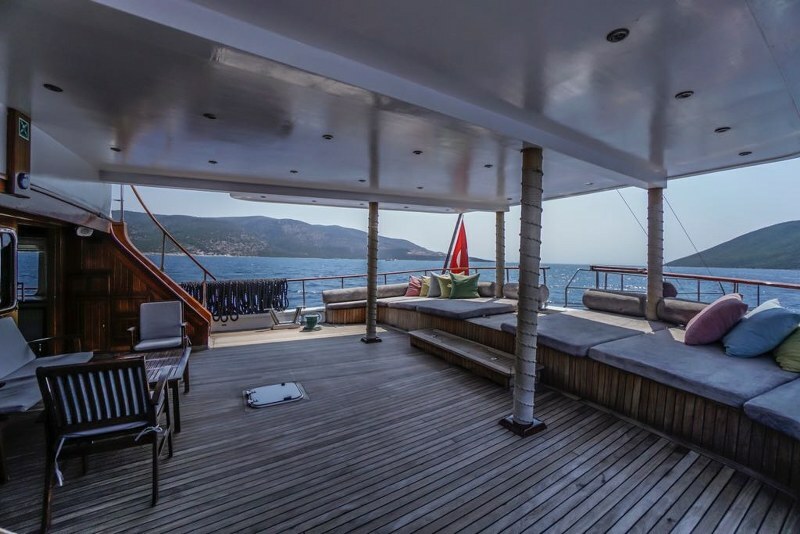 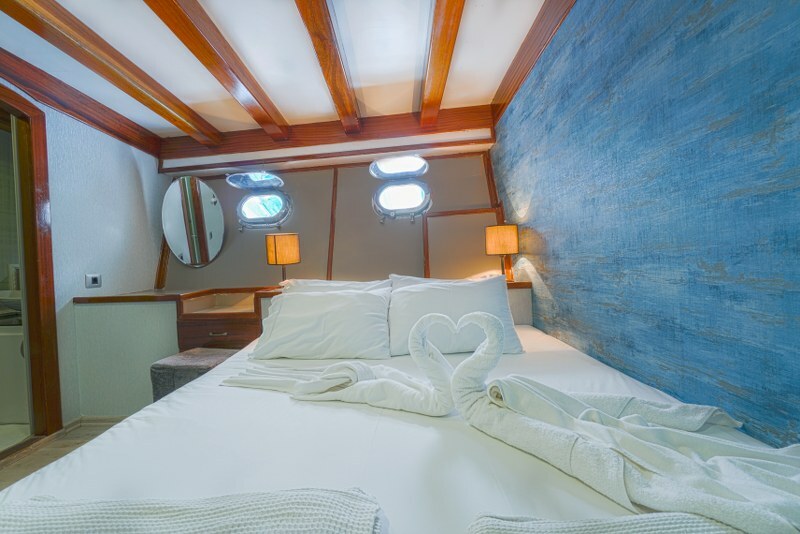 Within her attractive and classic gulet hull, there are all the modern comforts of comfortable beds, well-appointed bathrooms for each cabin, air conditioning, indoor dining and relaxation areas with entertainment systems, and copious outdoor deck space for dining, sunbathing and relaxing. 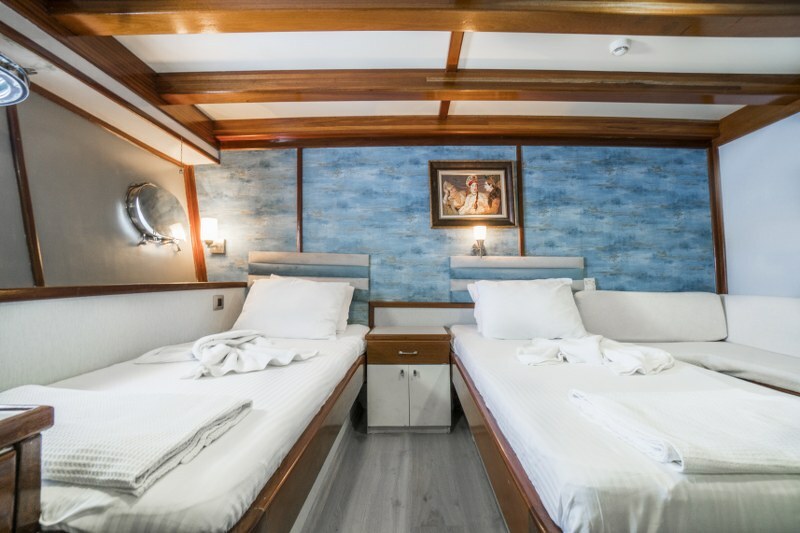 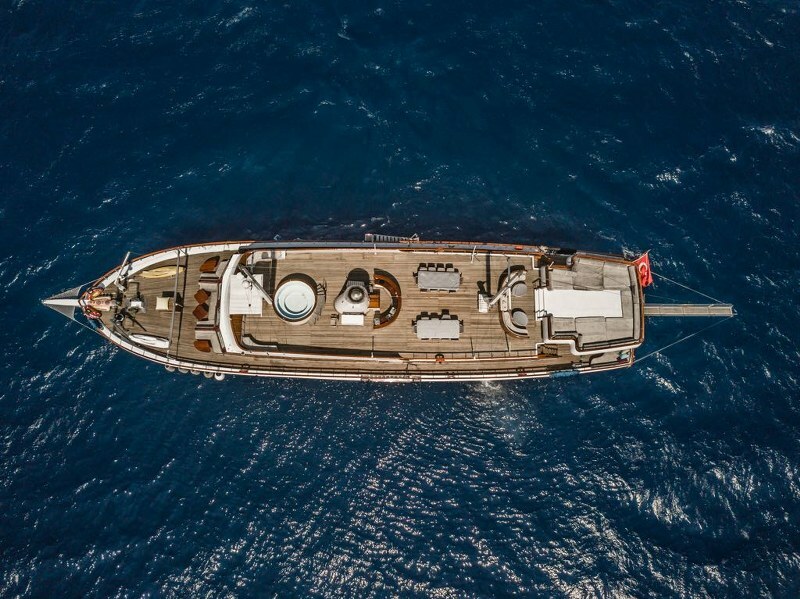 The gulet yacht ELARA 1 has twelve equal sized cabins arranged as six double bed and six twin bed cabins all carpeted with a seat bench, well-appointed bathrooms with showers and WC, mirror, TV with satellite, mini-bar, personal safe box, portholes and storage for each cabin. 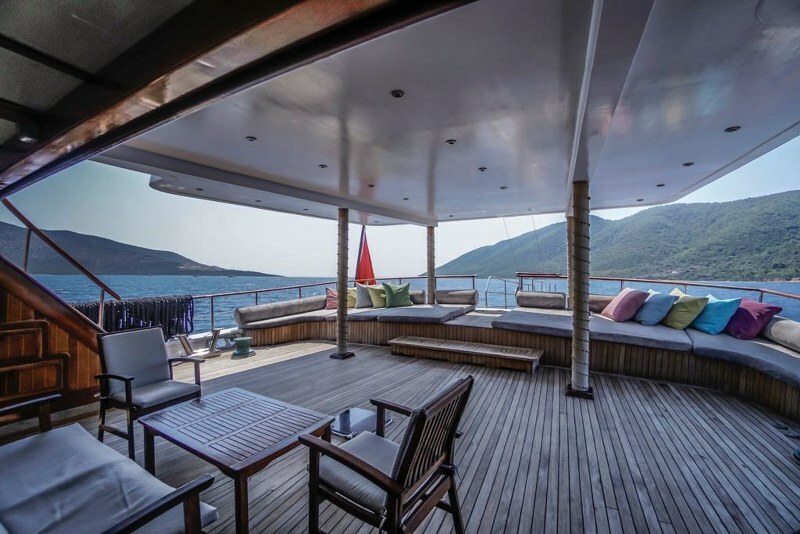 All have air-conditioning available. 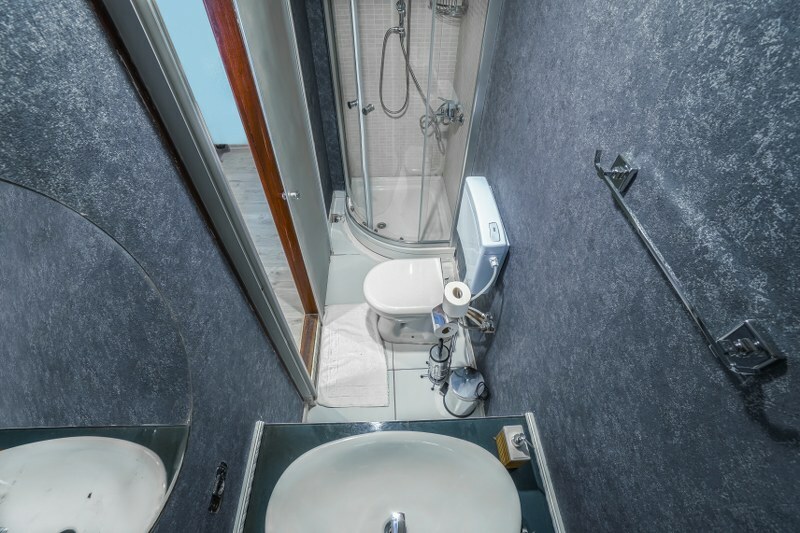 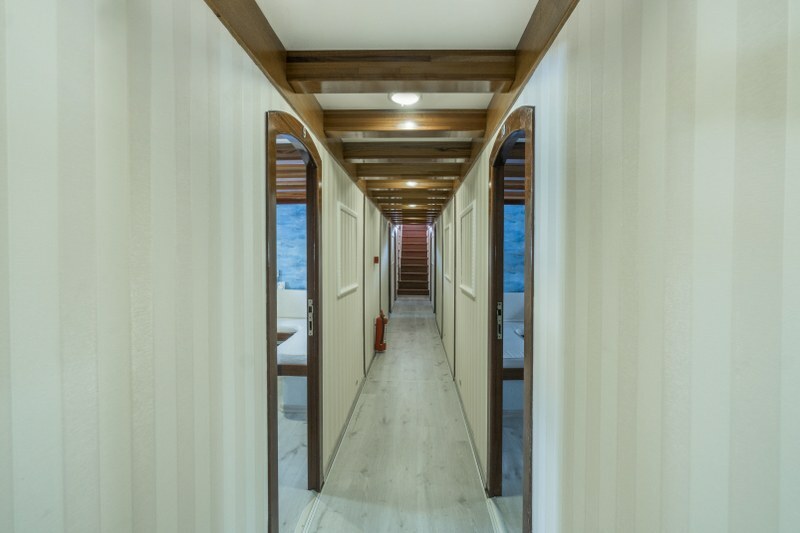 There are four double bed cabins aft with their own stairs entry from the saloon, and another entry and stairs from the saloon to the six twin cabins and two double bed cabins forward. 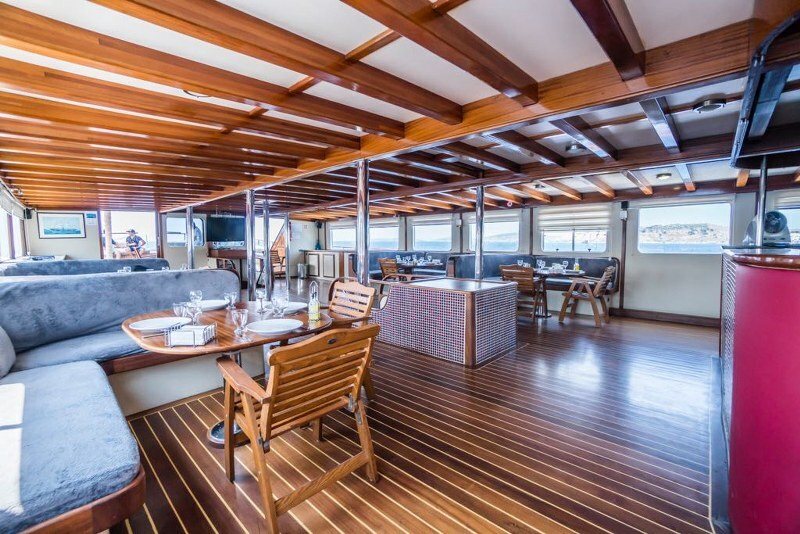 The main deck has a long indoor air-conditioned saloon which has four tables with bench alcove seating for the guests’ indoor meals or communal gatherings, or using the main TV/DVD/ music systems available. 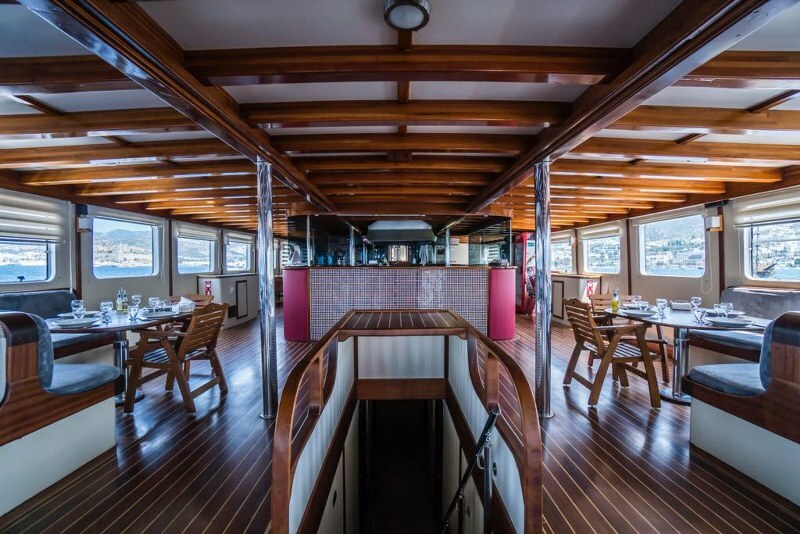 The galley (kitchen) is a half glassed island in the other end of the saloon, so all the activity of the chef can be seen as he prepares the delicious meals. 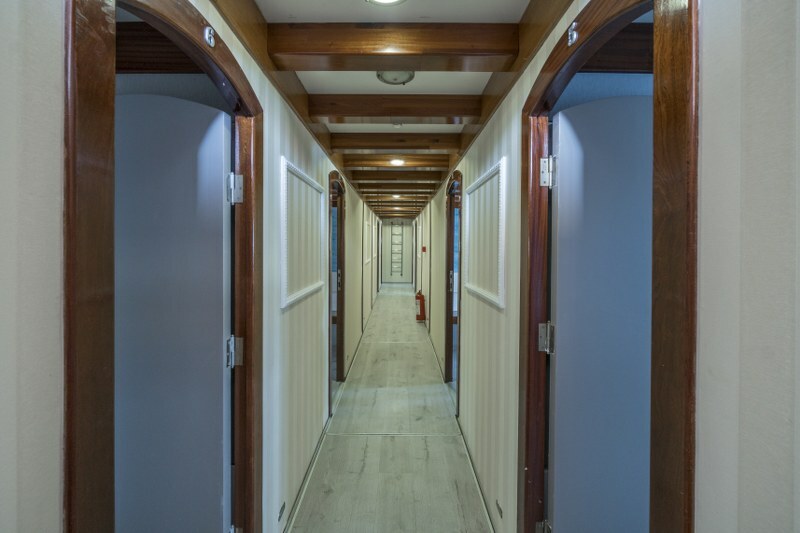 The main bar is also at the end of the saloon. 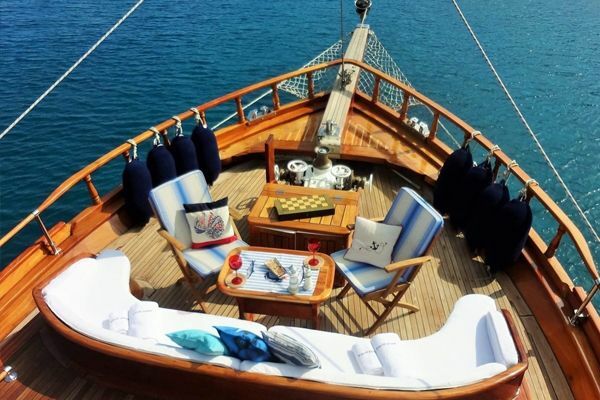 On the main deck there are shaded cushioned bench seats and tables in the bow, and wide cushions across the stern in the shade. 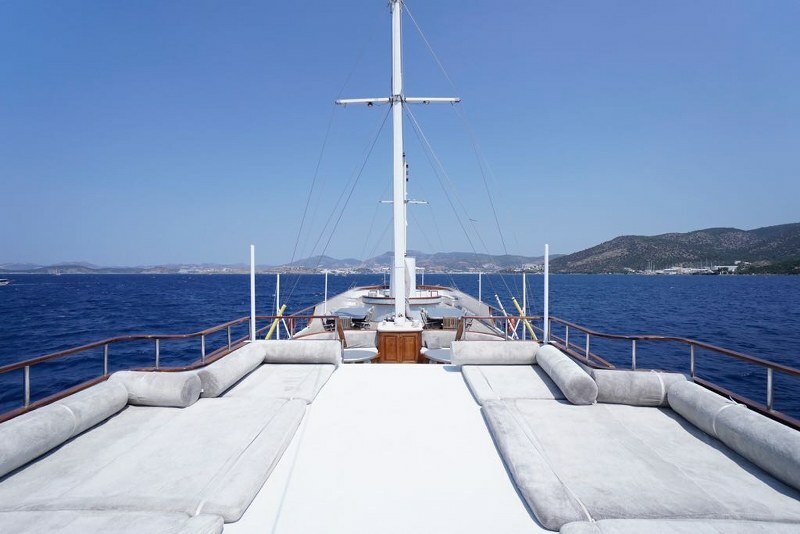 There are stairs let down into the sea on both sides of the boat for ease of entry into the water. 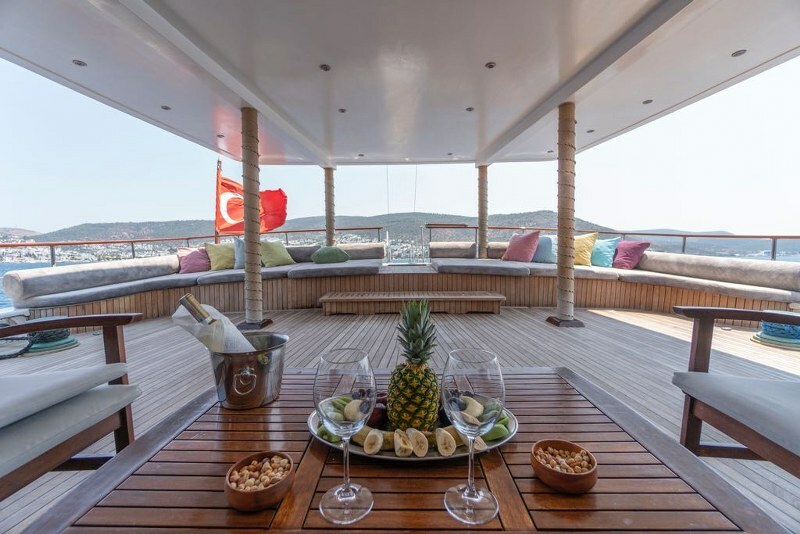 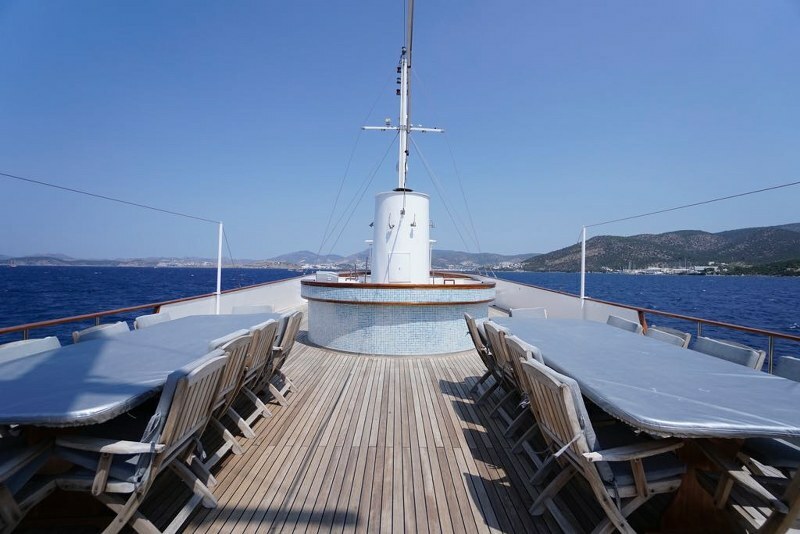 On the upper deck of Turkish yacth ELARA 1 ; there are more choices for relaxing, from leaning on the wet bar around a vintage style ship’s funnel, lazing on the huge cushioned sundeck deck over the stern, chatting in the round on shaded cushioned benches, or dining under the stars or shade on the long dining tables. 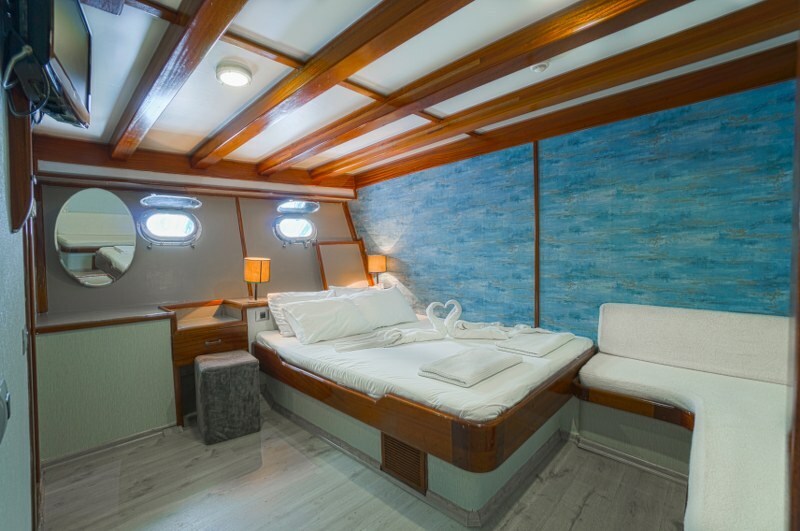 The ELARA 1 has an excellent and efficient arrangement of spaces affording ease of movement between all areas. 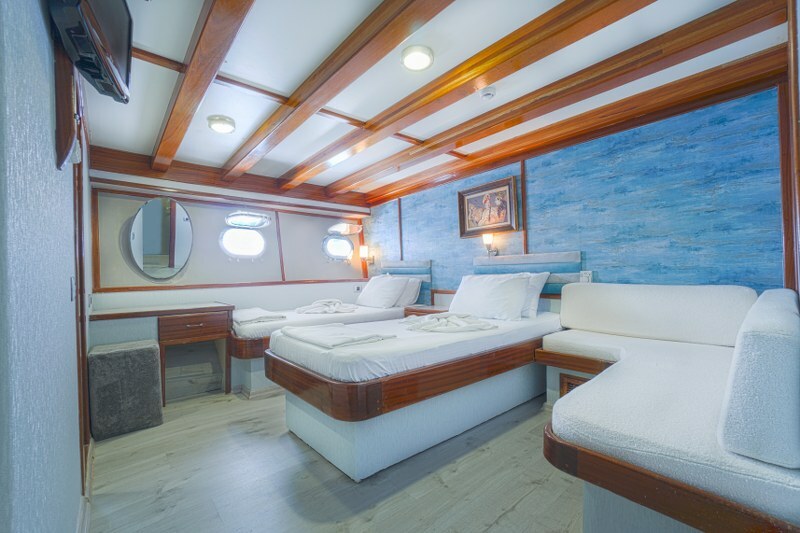 The professional and hospitable captain ( 4 years aboard), chef ( of 4 years ) and crew of five, who have their own separate quarters, attend to all the meals preparation and service, bar service, cleaning, boat care, and use of water toys and equipment by guests, so will do all they can to make sure that the guests enjoy their cruising holiday on the Aegean and Mediterranean coasts of Turkey. 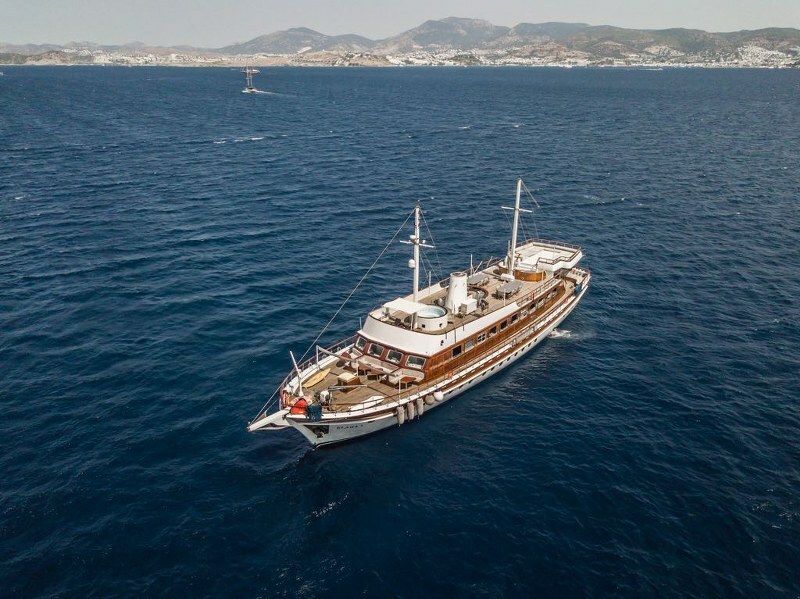 As a motorsailer charter the Halis Temel not only offers cruising itineraries along the Aegean coast of Turkey, but is one of the rare yacht charters which is licensed to carry its full complement of twenty-four guests among the Greek Islands of the Dodecanese such as Rhodes, Symi, Kalymnos and Kos, and even to the Cyclades Islands of Mykonos, Naxos and Santorini for longer two week cruises. 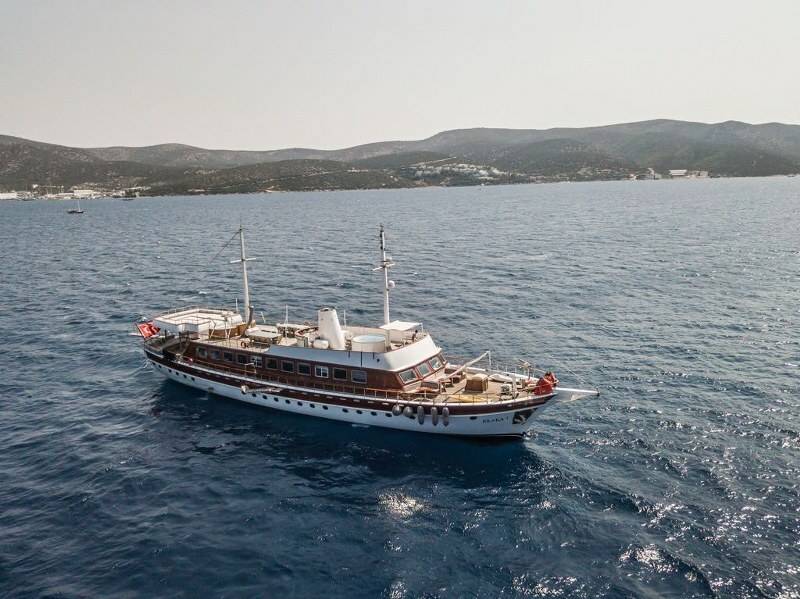 All of these destinations offer beautiful scenery, fascinating villages and quiet sheltered bays where the active can explore ashore, or play on the water toys available on board including water skis, ringo, and canoe. 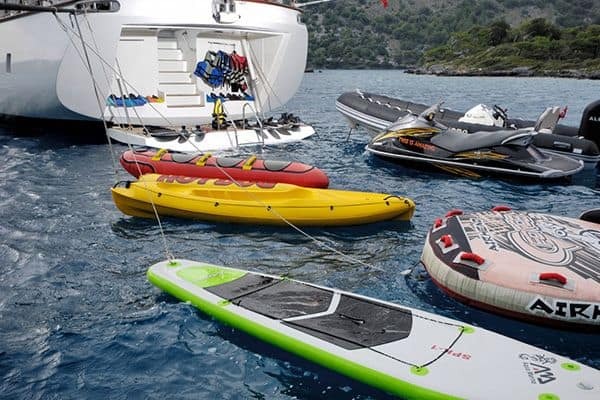 Other watersports toys can be hired for use on board.